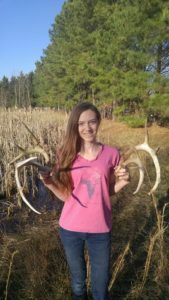 You are here: Home / Adventure Travel / 6 Tips and Tricks for Antler Shed Hunting! 6 Tips and Tricks for Antler Shed Hunting! It’s spring time, time to get outside and stretch your legs! Antler shed hunting is a great way to do it. Along with amassing a great antler collection, you will learn more about your hunting spot, be able to take the kids outside and get some great exercise! Here are a few tips and tricks to help get you finding antlers like a pro in no time! Check near water or food sources: Deer are spending a lot of time replenishing all the minerals they have lost over the winter. Bucks need these minerals to grow their new antlers and does need the nutrients to provide milk for their fawns. Since the deer are spending so much time around food and water, it’s a great place to look! Check bedding areas: This is one of the few times of the year when it’s safe to go into their bedroom. Deer spend a lot of time in their bedding area, it makes for a great spot to look. Also, be sure to check in between food and bedding areas. Get in the thick stuff: Head back in the thick part of the area. Deer antlers typically get caught on briars, they get knocked off on trees, etc. This makes for a great spot to look! More eyes: Take the kids, your friends, or anyone else you can think of. More eyes can help spot more antlers. Plus it’s a great opportunity to pass on what you know! Walk, walk, walk: The more looking you do, the more ground you cover. The more ground you cover, the more chances you’ll find that antler gold mine! X marks the spot: White-tailed deer typically shed their antlers in the same area. To find a matching set, after you find one, walk in circles around that area until you find the other. Be sure to stay tuned to for an upcoming article on what to do with all the shed antlers you’re going to find! I love that a person included which hunting throughout specific times won’t bring preferred results. It really is helpful to understand that creatures are wiser than we may think, and they detect patterns. Now later on, I may avoid producing that error.